South of Brunswick, Maine, is Harpswell, a town of about 6,000 people. The town of 24 square miles has a North Harpswell, a Center, West, and North, as well as Orr’s and Bailey Islands, and Cundy’s Harbor. 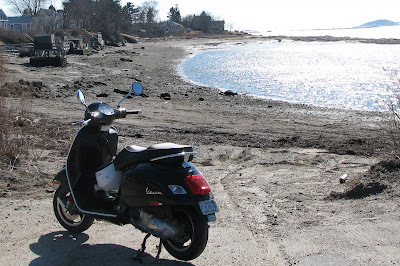 During my ride down Route 123 from Brunswick to Potts Point at the end of Harpswell Neck, I experienced what can only be described as a prelude to a boat ride on a choppy sea. Yes, it’s pothole season in Maine. This was my first long (110 miles roundtrip) on my new Vespa 250, and the weather was far superior to a typical mid-March day in southern Maine. With just a few clouds in the sky, and a high temperature of nearly 60 degrees, I thoroughly enjoyed the ride. This photo shows just how much land is exposed at low tide. Note on the left the small docks left high and partly dry – a good 8-to-10 feet of water will flood this little cove in about six hours. Until roads are built to each and every island, I’m satisfied to say that there are a whole big bunch of islands in Casco Bay.